Cosmin R. is the project lead and gamification expert for Nobel Explorers. He is the person behind Nobel’s system that rewards students with badges and allows them to track their progress. Cosmin also uses his game design expertise to teach Explorers how to make their own board game. He shares his personal experiences working in a global team and talks about the advantages of having teammates all over the world. Question: Could you tell us a little bit about your own experiences working in global teams? Cosmin: I consider myself very lucky because I’ve had plenty of opportunities to experience global teamwork environments. My first IT company had headquarters across the world in places like Canada, the U.S., and in Romania as well, which is where I’m from. It was an opportunity to communicate and work directly with people who shared my area of expertise. I had similar experiences at an international student NGO and while working on many different projects that also depended on the productivity of global teams. Last but not least, I found my dream job by joining Nobel Explorers, since it allowed me to combine two of my biggest passions: education and gamification. Not only that, but I get to work with people from all over the world in a modern environment while contributing to the education of the next generation of students. All of my experiences working in international teams have inspired me to seek out these characteristics in my career choices. I’m always looking forward to exploring global teamwork environments, which is one of the reasons I’ve applied to volunteer at the 2020 Summer Olympics in Tokyo. Q: Let’s start with some basics and discuss the characteristics of a global team. What is a global team exactly? All jokes aside, global teams are not that different from any other team. They’re defined by the fact that they include people from different places around the world. The foundation of the concept is still a team, while global is something that embellishes and adds value to the initial idea. In their essence, teams are teams, no matter where people come from. Q: Based on your experience, what would you say are some of the biggest benefits of working in a global team? C: It’s exciting for many reasons. For starters, you get to know and work with top talent from all over the world. You get to meet experts from your domain selected from a global pool, not just those from your local area. Take my current situation at Nobel as an example. I’m working alongside a hard-skills expert from Serbia, all the while consulting with a leadership and teamwork-skills expert based in the Philippines. With the introduction of global teams, borders and geographical distance are no longer an obstacle. Working in global teams gives you a much clearer and more realistic view of the world and it’s a great way of overcoming cognitive biases. You learn that the world is not as scary as it might seem if you only experience it through the eyes of the media. Having international colleagues encourages the development of a positive mindset. Another thing is that social interactions in global teams often result in friendships and it’s pretty obvious why having friends all over the world is great. For example, during my student years, I was able to organize a cross-Europe trip, going from one country to the next, only visiting friends. This is precisely what our Explorers look forward to when they finish one of our projects. Many of them have mentioned that they can’t wait to visit their teammates and meet with them in person. JOIN A GLOBAL TEAM AND DEVELOP ESSENTIAL SKILLS FOR SUCCESS! Lastly, I believe global teams are the future. Looking at some current trends in the business world and the way technology is evolving, it’s pretty clear that working remotely alongside internationals from all over the world is becoming the standard. It’s the next stage in humanity’s progress and something we can look forward to in the years to come. Q: Considering the other side of the coin. Do you think there might be some disadvantages or challenges related to working in a global team? Are there ways to overcome them? C: Global teams are primarily affected by challenges common to all teams. I’d say 90% of the issues simply derive from the fact you’re working as part of a group. Having said that, there are some challenges specifically related to the “global” aspect. Globally distributed teams are definitely affected purely by the physical obstacle of not being able to share the same room. These challenges have been overcome by advancements in technology, meaning every team would need to have a proper tech setup. Additional benefits can be achieved if team members adhere to an online etiquette, like the one we teach in Nobel Explorers projects. There are some communication barriers. For instance, some words in different social contexts can have more or less different meanings, so that can sometimes cause confusion within a team. Other misunderstandings could arise from cultural differences. By exploring and learning about these differences, we’re both preventing these misunderstandings and also broadening our perspective. In the end, every healthy team develops a culture of its own, which concerns things like work environment, values, etiquette, and so on. Building a company culture unites team members and if developed properly, it’s also a great way to overcome cultural barriers. Q: You mentioned that these teams need to have a proper tech setup. What are some of the tools and software you’ve used to ensure the productivity of a global team? C: I’ve worked with and tested a lot of different tools and apps. One of the main things you’ll need in terms of software is something that will enable you a face-to-face interaction. My top three picks would be Google Meets, Skype, and Zoom. Another essential tool is Google Calendar for planning and organization of work. Working in different time-zones can be tricky and using an online calendar is a great way to overcome potential issues. For written communication and document sharing, you’ll need an email service, such as Google Suite. You can take things to the next level by adapting to a collaboration hub like Slack or something similar. These collaboration tools are very valuable for project management because they allow everyone to stay up to date with their tasks and the overall work of the entire team. Q: What are some basic principles of global team communication and how can we make sure it’s effective? C: In order to properly function in a global team, each person needs to develop certain communication skills. They are numerous and each of them contributes to effective communication within the team. Some of these skills include things like asking verifying questions, demonstrating that you understand what others are saying, conveying a level of certainty regarding your statement, and even asking people who are quiet to speak up. There are lots of things you can do about improving communication and practice is key. PRACTICE COMMUNICATION SKILLS WITH OUR EXPERT COACHES! At Nobel Explorers, we use a talent tree to track the progress of our Explorers and make sure they’re developing the right skills, both technical like coding, and entrepreneurship, as well as teamwork and leadership skills. One of the branches focuses exclusively on communication, especially in a virtual environment, since all of our projects are done online and in real time. Q: What are your thoughts on leadership in global teams? Could you share some tips on how to lead a successful global team? C: Whether you’re going to be a good leader or not will depend on most of the aspects of global teams we’ve already discussed like communication, culture, and etiquette. So dealing with these aspects and optimizing them will be an important part of your responsibilities. I would say that the basic principles of leadership work for all teams, including global ones. My advice would be to stick to the basics and you’ll do great. Ensure that you’re focused on the right question and that you have a common understanding of the problem. Listen to your team members and ask for their feedback. Empower them to give their best and create a setting where it’s OK to make mistakes. Q: How can children who have signed up for Nobel Explorers benefit from working in global teams? C: Online learning itself is a great opportunity but one of its main challenges is that people struggle to keep their motivation. For instance, did you know that only 10% of people who enroll actually finish an online course? So the vast majority of people drop out and it’s mostly because they’re not engaged enough and they’ve lost the initial drive that led them to sign up in the first place. The fact that our Explorers get to work in a global team reduces their chances of quitting on many different levels. When they work together, they form a bond among themselves and build a sense of responsibility towards each other. They become aware that by leaving the project they’ll also be abandoning their friends and damaging their work. And when things get tough, they’re not alone. They share the bad and pick each other up. It’s an amazing thing to witness first hand. We’ve also incorporated many different features and methods that increase the motivation of students and allow them to stay engaged throughout the course. They get to work on projects they chose themselves, so that way they’ll surely be working on something they really find interesting. One reason people quit is they get frustrated and can’t overcome a challenge. Each project has a team of expert instructors who are there to help students whenever they get stuck and encourage them to see the project through. Finally, when they finish the project, they have a tangible product with real-life value to look forward to. The proof that our approach works is in the stories of our Explorers who’ve kept working on their product even after the course is done. It’s very fulfilling to see them wanting to improve their product further and continue working together. I wish I had had the chance to work in global teams when I was a kid. Meeting cool people from across the world and working on projects I was actually interested in would have been a truly exceptional experience. But I’m also very glad I get to contribute to the cause and help open up opportunities for kids everywhere. Are Gifted Children Limited in a Traditional School Setting? 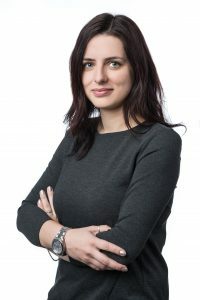 Sophie is an academic, test prep, and life coach at Nobel Coaching & Tutoring as well as project instructor and soft skills expert for Nobel Explorers. She is an authority on the topics of developing teamwork and leadership. Through 1-on-1 coaching sessions, she helps students improve both their academic and personal life, all the while learning about the challenges children are facing in the 21st century. Sophie shares her insights on gifted students, their characteristics, challenges they face, and what parents can do to help them reach their full potential. Question: What does it mean to be a gifted student? Sophie: The term itself is very much related to and represented in the field of educational psychology, and there are many definitions of what it means for a child to be considered “gifted”. The consensus is focused mostly around the fact that gifted children are those who have really high intellectual capabilities. Other definitions usually build on this in various ways, for example, adding into the mix other characteristics such as talents for specific activities. I myself prefer sticking to the first, narrower version of the definition because I believe it’s useful to make a distinction between “gifted” and “talented” children, since they will be different in terms of their advantages and challenges. Q: So why don’t we just use the term “intelligent”? S: All gifted children are highly intelligent, but not all intelligent children are gifted. When we talk about gifted kids, we assume they have innate high intelligence. However, you can have a very intelligent child who is not classified as gifted because they might have some issues in school. For example, they have ADHD or they struggle with executive functioning. So for a child to be considered gifted, they’ll need to have a combination of a very high IQ and good executive functioning skills. Q: What would you say is the main game-changer for gifted children in the 21st century? S: I feel like a lot has changed for gifted kids in the last 30 years or so. Mainly because before that, there weren’t that many specially designed programs for them to explore that would allow them to unlock their full potential. They used to be limited to the regular classroom with all the rest of the kids, which had its pros but some cons as well. Q: How can we spot gifted students? What are some of the main characteristics of gifted students? S: Gifted children seem to be gliding through school without any difficulty whatsoever, and this should be your number-one clue. If you’re a parent, you might notice that it takes them no time to finish their homework. You kind of get the impression that school is super-easy for them and they get through it without ever struggling. These kids are able to adapt to new challenges pretty quickly and they easily grasp new ideas. For instance, when introduced to fresh materials in subjects like math, which most kids struggle with, they don’t require a lot of practice. Not only do they have the ability to acquire new concepts faster than the rest of their peers but they also learn to apply them really well. Q: What would you say are some of the main obstacles gifted students face these days? S: I think there are several issues for gifted kids in the traditional educational system. The main one is that they’re not really being challenged. Gifted children are probably bored at school. They’re probably bored out of their mind! If everything comes easily and naturally to them they’ll never have the opportunity to struggle and build resilience. Finding something that actually challenges them will help them keep growing and learning to overcome obstacles. The obvious solution might be signing the child up for a gifted program or have them attend a school for gifted kids, but that comes with another set of issues. Sure, now they’re being challenged so that’s one less thing to worry about. Still, these kinds of environments tend to be really competitive and that can cause a lot of anxiety in a student. Even though they’re very good, even though they’re very smart, having to perform in a context that promotes competition can create a lot of pressure and have a very negative effect on a child’s mental well-being. Another obstacle they face in today’s schooling system is that they never learn to properly work in teams. This is a big issue as regards modern and future workplaces. The set of challenges that humanity is facing nowadays is really complex. Let’s put it this way – if a problem was simple enough, we’ve already solved it. What we have today are challenges that require tackling from multiple angles, by experts in different fields. Having a good, strong team and knowing how to function in it is an essential skill for professionals in the 21st century. Now, if you’re a gifted kid and you get teamed up with someone at your school in order to, say, complete a project, a couple of things can happen. Option one is you’ll be doing most of the work. This is teaching gifted students that teamwork is all about you doing the lion’s share of the work and other people just coasting along. But let’s consider that your teammates actually want to help. The gifted child still has very high expectations, which could make them want to contribute to other aspects of the project and take over assignments of others as well. In the first common scenario, gifted students are learning others are lazy and don’t want to do their part. The second teaches them other people can’t really perform to their standard and since they’re fearing a lower grade, they think they have to do the work themselves. The main factor at play is that they are not teamed up with people who are at their level of understanding. To really learn the value of teamwork you need to be on a team with people who have abilities or skills that are different from your own but at pretty much the same level. A context where either someone’s a little bit better or you’re a little bit better than someone else. As a group, you all need to function on a similar level in order to appreciate the value of working in a team as opposed to working by yourself. Q: What can gifted children do in order to overcome these common challenges? S: The main thing is to find an interest or a project that really challenges you and puts your capabilities to the test. That is something these kids lack in the school system. Go into something that doesn’t come naturally and doesn’t come easily. That might be learning a musical instrument or practicing a sport or it can be a host of different things, but find something that really feels challenging and you have to work for. What’s difficult for you might not be for someone else, and will differ from person to person. Maybe you’re really talented at school but you struggle with sports, so getting on a sports team will put you in a situation where you can work at it and gain resilience. Or maybe you’re great at school but you want to get more familiar with a particular subject. Let’s say you’re looking into something like coding or web-design. You can pursue it and go deeper to a point where it becomes really challenging. Even if your school doesn’t provide you with a challenge, I’m sure there’s more to that area than what you’re able to learn in school. The second thing is you need to find an environment where you can learn to collaborate with other people and that probably means finding a team that is at your level. So it can be extracurriculars, online classes, school newspapers, sports teams… Something that doesn’t come naturally, something that you really need to work for and that’s going to be very different for different kids. Q: In your opinion, what is the number-one skill gifted children should focus on developing? S: I think resilience is one of the most important skills that you can build, for all children. I think a lot of people view it as a trait and not a skill, but resilience is just knowing how to deal with obstacles. Not crumbling in the face of a challenge, but rather facing it head on and solving issues along the way. However, it’s a skill that a lot of people don’t learn and gifted kids are especially in danger of this since they meet fewer challenges early on. Everything comes easily to them which means they don’t have to learn resilience. But in life, as they go through the educational system and into the workplace, they will definitely face challenges. They might, say, get into a very competitive college. Now, all of a sudden, they’re surrounded with a bunch of people who are as smart and as talented as they are and the workload is a lot greater. There’s a lot more stress than they’re used to, and if they’ve never learned how to face challenges properly, this is where they might crumble. Q: What are some of the pros and cons of being a gifted student in the digital age? S: Some challenges are universal to all kids and they apply for gifted students as well. For instance, the era of social media is shortening our attention spans, which is a challenge for adults as well. However, the opportunities of the digital age are really great. Online, you can learn anything. There are so many things to choose from and if you have the right mindset, you can find something that will challenge you and you’ll want to spend your time on. Unfortunately, what I’ve often seen is that people start learning something and then give up fairly easily. They take up a course, it seems really interesting and a couple of weeks in their motivation drops and at that point, they just stop investing in it. So the opportunities are there, but making the most of them is not that common. Q: How can Nobel Explorers help gifted students reach their full potential? S: Nobel Explorers is a great opportunity for gifted students. What we offer them is an environment where they can learn to collaborate with other people and where they can work on something challenging. The projects that they’re working on can’t be done by just one person. This means they’ll be working on an online, international team where everyone has their own role. This is something that mimics most of the workplaces you’ll find in the 21st century. On one hand, they’ll have a team and their own role within that team so they’ll need to learn how to collaborate with the rest of the Explorers in order to complete the project. On the other hand, they’ll have the opportunity to go in depth on their area of expertise and interest. So let’s say their team is building a website and they’re the designer. Maybe they want to learn a little bit more about website design or graphic design in general. If they have extra time, they can go and do that without having to step on anyone else’s toes and overtaking other people’s assignments. Gifted children need the right environment in order to reach their full potential. 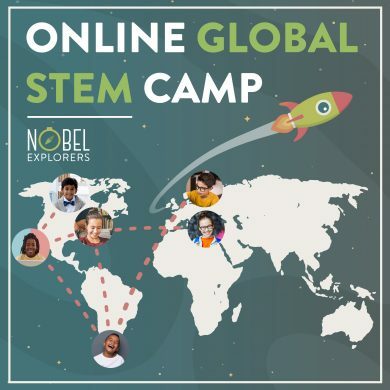 At Nobel Explorers, they will work in a modern online STEM camp as part of a global team, alongside peers who share their interests and abilities, while learning essential technical, leadership, and teamwork skills. Q: Can you share some tips for the parents of gifted children? What can they do to contribute to their child’s development? S: Parents should let their kids face challenges and help them through them. I think a lot of parents fall into the trap of doing everything for them just so their child will be happy. It’s very normal to feel this way, but the parents tend to go into obstacle-removing mode. They remove anything from their child’s life that’s difficult or unpleasant. This is a problem because kids who are really sheltered won’t learn critical life skills they’re going to need as adults. You need to let them face and overcome their challenges, whatever they might be. Whether they’re at school or they have social challenges with their friends, don’t remove the obstacle but teach them how to deal with it. You can start doing this when they’re very young. If your 5-year-old has a problem in the playground with another kid and they’re really sad or upset about something that this other kid did, you can be there and support them through that. But don’t simply take your kid out of that environment forever. These situations will be incredibly helpful for your child’s development. There’s one more issue parents can help out with. Gifted kids can sometimes have very high expectations of themselves. Parents play an important part here, their influence being greater or smaller depending on the situation. Let’s consider a scenario where the child has high standards for their performance and their parents share these expectations as well. That can be a problem if the child is intellectually well ahead, but emotionally still on the same level as their peers. A typical 15-year-old, even though they’re really smart and have no problem grasping all the subjects intellectually, can still struggle with the pressure of it. If you have a kid like that who is gifted but struggles with the pressure of performing at that level, help them lower the bar. It sounds counterintuitive but I’ve seen it first hand. These are usually kids who do math problems in their free time for fun. They don’t need encouragement. They need you to help them set the bar lower so that they can perform without feeling pressured. Help them understand and accept that they don’t “need” to get an A and you can suggest a less stressful goal, like getting a C, for example. What should happen is, even if they get the occasional B, they’re still probably going to get mostly A’s because they are still gifted, engaged, and interested. But by lowering the bar, you’ll be removing the pressure from the equation and reducing stress. Without pressure, there’s less anxiety, which means your child will be happier and healthier. Our Coaches are experts in stress management and anxiety coping techniques that will improve your child’s performance and help them build resilience. https://nobelexplorers.com/wp-content/uploads/2019/04/Gifted-Kids-1.jpg 877 1200 Predrag M https://nobelexplorers.com/wp-content/uploads/2018/05/nobel-explorers.png Predrag M2019-04-01 08:00:222019-04-15 11:09:05Are Gifted Children Limited in a Traditional School Setting? Andrew Sachs is the founder and CEO of Nobel Coaching & Tutoring, and Nobel Explorers. 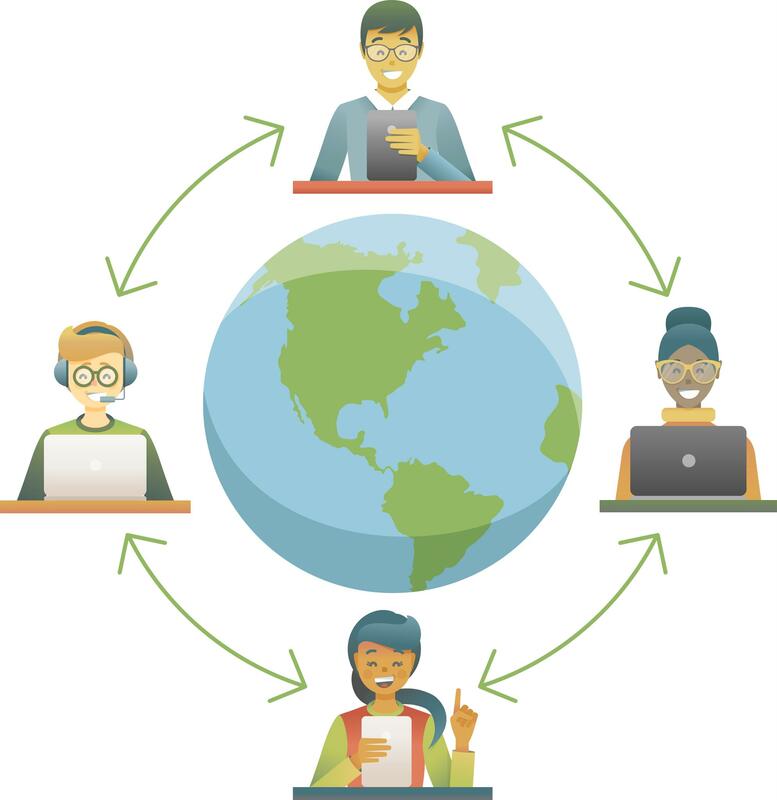 Through online educational coaching and tutoring, as well as an online, international STEM teamwork camp, Andrew’s vision for Nobel is to activate student motivation that results in improved learning outcomes. As the next industrial revolution draws ever so near, he talks about the importance of entrepreneurial, computational, and psychological thinking for the next generations of students. Andrew also shares some specific suggestions that will help children and young adults develop these skills in order to attain job security in the era of robotics and AI. Q: Why are these three skills so important for future generations of children? A: I think that it’s easy to understand why all parents want their kids to be good at reading, writing, and math. It’s an idea that made sense in the past because it was believed that these particular skills would be the foundation for securing a good career in many different professions. In fact, the educational system has been testing these skills extensively on a national, state, and individual student level of performance. The world has shifted a lot in the last 30 years or so. We can see new patterns and disciplines emerging and dominating today’s business world, such as globalization or informational technology. We’re witnessing their influence in things like the advancement of applications and social media. We are also seeing that technological progress carries with it certain challenges, especially for the psychological aspects of our being. There are viruses running through your head, not just your computer! Taking this massive change into account, there is a clear need for making a shift in the way we educate people and the skills we teach them. We need to go one step beyond reading, writing, and math, and move closer to entrepreneurial, computational, and psychological thinking. Q: Can you tell us a little bit more about these skills? What are they and how are they manifested? A: Entrepreneurial thinking is, at its core, systems thinking. Today, in a globalized world, the pace of business change continues to accelerate. You don’t have to be an entrepreneur in order to benefit from being able to think like one. Even if you’re simply looking to get a job and build a career at a specific company, you need to understand how that company works, the way in which it is evolving and adapting, how your job might fit into that particular system, and how your contribution to the company can change over time. Figuring out answers to these questions will help you pick a profession you’ll be happy with, while at the same time ensuring your economic success. Computational thinking is connected to three major areas of modern industry: traditional IT, AI, and robotics. IT is already impacting every business. It doesn’t matter whether you’re a doctor or running your own lawn-maintenance company, using information technology in order to provide your customers with the best possible service is a necessity in today’s business environment. A lot of people don’t realize that we’re already subject to machine learning and AI today. All the bots, everything that determines what YouTube video you’re going to watch next, what ads will show up on your Facebook side panel… all that is being done by Artificial Intelligence. It’s not a person doing it, but a complex algorithm. Understanding how these algorithms work and being able to apply them to any big data set for the betterment of the business that you’re in is really important. And then lastly, through the advancement of AI, we’re seeing a whole new domain of robotics being unleashed. The most interesting thing is that the mechanical aspects of robots have not changed much. What’s really changed is that now, for very little money, you can have a robot that’s extremely intelligent and able to automate many common tasks. By combining AI image recognition with traditional robotics capabilities, we’re looking at a world where you can easily train robots to do tasks that we might consider only doable by humans today. So why is computational thinking so important? Firstly, it can help you prepare for a career in a profession which is not easily replaceable by a robot, and secondly, it can allow you to look for and design a place for those robots and improve the efficiency of your work or your company. Last but certainly not least – psychological thinking. As humans, we’re still carrying this gray matter between our ears that was honed over millions of years of evolution as a nomadic pack animal. And, for lots of good reasons, it’s got features that are very well suited for that world, but not for the one that we’re living in today. Nowadays, we’re living in a complex society that is functioning under a different set of rules, and yet, these outdated mechanisms are still impacting the world that we see today and giving rise to many serious issues. These biases are being utilized in order to manipulate behavior – for example, through the use of fear. The impulsive reactions that we make when we’re in a state of fear are usually not the best ways to deal with a situation. Psychological awareness is an important tool that can help us identify these biases and manipulations so that we can consciously work them out, protect ourselves from them, and make better, more rational decisions. Developing these skills does not mean you’ll be limiting your career choices. If you’re developing entrepreneurial skills, it doesn’t necessarily mean you’ll end up running your own company. Neither does learning to code mean that you’ll become an engineer. These skills can be very useful in many different ways for many different professions. As parents, we should make sure our kids learn them as soon as possible so that they’ll get a much better understanding of the world and be more successful. Q: What are the top three tips for developing these essential skills and what can parents do to help? For computational thinking, you can get into coding and there are several ways to ease yourself into the field. Number one is block-level coding, where the whole process is more graphic and much easier to comprehend. There’s also a fantastic tool called Scratch from MIT which is also very approachable. Furthermore, you can use this knowledge to try and build something tangible, such as creating a small video game or an app. You can then explore supervised machine learning and creating genetic algorithms. These items can be very simple but actually coding them and learning how to take a complex, undefinable process and break it down into things that can actually be done is a really great skill that applies everywhere else in life. LEARN HOW TO CODE AND DESIGN A WEBSITE! Psychological thinking can be learned and improved in many different ways. For starters, take a psychology course. Study biases. Work inside a team. All of these activities will provide you with a great setting for learning how to think in terms of human psychology and its challenges. One of the easiest exercises you can do? Find people who actually disagree with you on things but are constructive in their dialogue. Have discussions with them, all the while trying to better understand their point of view. Q: How will these predictions affect the future of education? What can we do to prepare children for the future of work? A: The question of job security and relevance is really important for all parents out there. Especially now when robotics, AI, and Informational technology are coming at our economy like a freight train. If you thought the industrial revolution changed a lot or if you thought IT changed a lot, you haven’t seen anything yet. What can parents do about that? Well, if your child is interested in software, robotics, or AI, then help them go for it. But, more importantly, if those career choices are off the table, there are two things you can do to ensure your child can find work in tomorrow’s economy. Primarily, you can encourage them to choose and engage in industries that are less susceptible to disruption. Secondly, you can help them develop their soft skills. Robotics and AI are not going to lead to a “Terminator” scenario. What’s really going to happen is whatever individual hard skill you might have, that task is going to be better done by a computer and AI in 5, 10, maybe 15 years. So you need to pick a profession that won’t be totally obviated and made redundant by technological advancements. If you’re thinking about going into radiology and reading X-Rays, you need to think again. Or if you’re thinking of becoming a translator? Don’t! I’ve already listened to a Google Translate version which is currently being used exclusively throughout the company, and it works better than humans. Don’t bet your career on a hard skill. But, match that hard skill with 21st-century soft skills. Critical decision-making, teamwork, collaboration… And whatever it is, make sure you develop the skill to adapt. Because one thing that will be constant is change. Q: How can Nobel Coaching & Tutoring and Nobel Explorers help students develop these three skills? A: Our coaches are well trained and focused on teaching the principles of positive psychology and encouraging people to become the best versions of themselves. So if you’re dealing with academic, real-life, or even business issues, our coaches can help you in all those areas with specific focus on psychological thinking. This involves learning about our biases, how to communicate better with other people, and even understanding how to create habits in order to help ourselves improve. But maybe the most interesting aspect is that our coaches nurture what is known in psychology as the growth mindset, the notion that you can actually change yourself. And that is essentially the main goal of Nobel Coaching & Tutoring. To help people change themselves for the better and get to a version of themselves that they want. 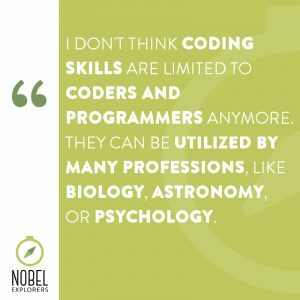 While Nobel Coaching is focused on improving psychological thinking, Nobel Explorers really goes after the computational and entrepreneurial mindset, and all of the projects are designed to help students acquire these types of skills. It is an online international STEM camp and every one of the projects is designed to incite age-appropriate learning. For the development of entrepreneurial thinking, we offer some silicon-valley styled courses where students get to learn how to start up their own company. For computational thinking, we have many Nobel Explorers classes where we’ll be covering the topics of coding and web design, artificial intelligence, and robotics. We introduce these subjects to our students through practical assignments and at the end of each course, they will definitely have something to show for it – along with gaining valuable, life-long experience. It’s important to make note of the fact that all of our classes are organized through project-based learning, as well as team-based learning. Each and every class has an entire soft skills curriculum embedded into it. On top of learning computational and entrepreneurial thinking, the students are also acquiring soft skills such as communication, teamwork, how to have constructive conflict, and how to make group decisions. All these soft skills we’ve talked about can be taught to children as young as eight, if the setting is right and adapted to their needs and interests. And that is exactly what Nobel Explorers does. Nobel Explorers offers a range of STEM projects which are age-appropriate and provide students with an opportunity to develop entrepreneurial, computational, and psychological thinking by solving complex problems in a team setting. Q: Some parents might be afraid that their children are too young and not ready to get into coding or other activities you’ve mentioned. What are your experiences in regards to actually working with children and teaching them these skills through Nobel Explorers projects? A: I think the fear of children not being ready to learn comes exclusively from the parents and not the kids. We make sure children are capable of following, participating, and of course, learning from the projects by making them age-appropriate. At the entrepreneurial level, if we’re discussing 8 to 10 year-olds, it’s the equivalent of a lemonade stand – understanding things like what happens when we raise or lower the price, or move the stand to a high traffic area. The same goes for computational thinking. It might be a ‘Scratch’ robotics assignment where you’re helping a dog find a bone in the maze. Or, if the children are a little older, they might learn some of the fundamentals of coding in Python. Even the psychological and teamwork items are age-appropriate. We start out with respecting other people, allowing other people to talk… Then we go on to encourage focusing on ideas and not the people and teaching kids how to do active communication and so on. The earlier they acquire these skills, the faster and more advanced is the learning. If a student learns how to communicate as part of a team at age eight, then maybe they can learn how to have a constructive conflict by age 10, and at 14 they could be showing signs of leadership. The point is, in today’s educational system, we’re not focusing on teaching these skills to our children at all. But if we expose them to those skills and give them the experiences to actually try and master them, it turns out you can start as young as eight years old. Q: What does the future hold for Nobel Coaching & Tutoring and Nobel Explorers? A: For Nobel Coaching & Tutoring, we’re currently working on expanding our coaching team but also on expanding the domains in which we coach. So we currently offer academic coaching for students young as six, but with a high focus on academics. We also have life coaching, where we help people with their choices in life and adjusting to change. One thing we’re also looking into is bringing in business coaching to help people create and work in better environments, learn how to handle challenging coworkers or bosses – all with the goal of making work a more pleasant place. For Nobel Explorers, we’re highly focused on the 8-18 age range and a lot of our classes are very much beginner classes. But for example, we’re also preparing things like a ROS, Gazebo robotics class, where we’re combining machine learning and AI with robots, and we’ll be teaching students to design robots using genetic algorithms. The main idea is that we’ll be helping middle school and high school kids learn things that lots of college students don’t even get to master. Would you like to stay up to date with all our upcoming courses, projects, and offers? Hello, Nobel Explorers! You might have noticed some badges starting to pop up on your profiles. In case you wondered what they were and what they mean, check out this guide that will provide you with all the answers and explain just why are they’re so important. Student uses verbal and nonverbal cues to express active listening. Showing that you’re not only paying attention to what’s being said but that you’re an active part of the conversation is a skill that is a vital aspect of teamwork. It conveys interest in what’s being said and helps you stay involved throughout the discussion. Getting friendly with everyone and remembering their names and roles is common courtesy 101. Furthermore, it’s important because it helps build cohesion, facilitates communication, and saves us from being on the receiving end of one or two facepalms when we’re trying to address each other in a group setting. Student is able to maintain focus throughout the meeting. Sooner or later during a discussion, you’re going to get the chance to pitch in. When that happens, you need to be ready. Maintaining focus throughout a session will allow you to contribute to the conversation in a relevant and meaningful manner. Student lets teammates know if he/she understands them or not. When someone is addressing you directly, it’s important to convey whether or not you’re able to follow their train of thought. If you are, then you’ll be encouraging them, but if you’re not, then they’ll need to know in order to adapt their presentation accordingly. In good teamwork, misunderstandings are dealt with immediately so that everyone can keep up. Student lets teammates know when he/she is done sharing. As a rule, it’s good to end your sentences with a signal cue that would let others know that it’s time for them to pitch in. If this becomes a habit, it will encourage everyone else to listen for that cue and not jump in while the speaker is in the middle of a sentence or simply not finished speaking. Student understands the difference between facts and opinions, and is able to qualify statements accordingly. When opinions are misconstrued as facts and vice versa, the whole conversation can be derailed. Opinions are very useful in driving things forward, but facts have much higher validity and are what provides any scientific discussion with structure. That is why it’s important to highlight your statements and qualify them as either fact supported by evidence or as an opinion which doesn’t have to be. Student openly asks clarifying questions about things that he/she doesn’t understand. People are often afraid that they’ll ask the wrong question and they fear how others will react. Not asking questions when necessary will always be much worse, because a topic which isn’t well understood can be of consequence for everyone in the group. It’s often the case that an unasked question at one point has a tendency to turn into 10 new questions later. Student encourages his/her teammates to share ideas. Ideas trigger other ideas. Not all of them are bound to be great, but even they can inspire others to think of better ones. By encouraging others to share theirs, we are making a proper context for learning. When we express and discuss ideas freely, we can analyze, adjust, and transform them into better ones, and everyone gets to learn something in the process. Student checks to ensure the rest of the group is able to follow and understand him/her. When speaking about a subject, it’s important to let people show you that they’re listening and whether or not they understand what’s being said. By doing so, you’re encouraging others to show that they are actively listening and allowing them the opportunity to get their Heads-Up Honcho or Vocal Explorer badges! Student makes project feedback easily accessible to everyone by using Google Sheets. Feedback needs to be recorded in a transparent manner so that everyone has a clear overview of the topic under discussion. Google Sheets are a great tool that everyone has access to and it provides a setting for driving the discussion further via chat and by leaving comments. Student asks for feedback on his/her ideas and work. Feedback is the most important step in learning. Without it, we would never truly be able to know if what we’re doing makes sense or not. People often confuse feedback with criticism because each has the same component of essentially telling someone what was wrong about their work or actions. The difference is in the intention and the constructive suggestions that accompany feedback. This should not frighten a Nobel Explorer! Student helps others learn and grow by providing them with constructive feedback. This just means that giving and receiving feedback require a certain level of skill! Sharing direct information in a kind, yet encouraging manner is something that needs to be mastered but it’s also the most valuable asset in a teamworker’s toolkit. Student stays focused on the driving question throughout the discussion. During a discussion, it’s easy for people to get more or less off track. This doesn’t mean that the topic emerging is not worth discussing, but rather that the main agenda needs to remain the focal point. The key is being able to recognize when the conversation is drifting and to act quickly to readdress the driving question. Student uses WH- questions to understand the problem better and come up with appropriate ways for solving it. Using questions that begin with who, what, when, where, and how is a powerful tool for getting familiar with all aspects of a specific challenge. These five types of questions will provide you with all the information you need and provide a better vantage point before tackling the issue. Student is able to come up with a quick fix for the problem at hand. Coming up with quick-fix solutions isn’t applicable to all situations, but when it is, it can be quite rewarding for the entire team. Now all the time that would usually be spent on a lengthy discussion can be directed towards solving the more difficult challenges. Student utilizes mind maps to better understand different ideas and how they are connected to the central concept. When presenting everyone with a complex topic, mind maps are a great way of making sure everyone understands the central concept and how exactly all relevant ideas are connected to it. If prepared correctly, everyone will be able to better understand the topic at hand and it will save the team from having to go over lots of different questions. Student records ideas about the project in their alone time. Many of the greatest minds have made their famous scientific breakthroughs outside of their laboratories and offices while performing common everyday tasks and activities. When inspiration strikes and an idea about solving an issue raised in class emerges, writing it down so that you can discuss it at the next meeting is the proper way to go. Student applies brainstorming to generate ideas. Brainstorming is a useful tool to have at your disposal when a challenge requires a particularly creative resolution. The greater the number of different ideas, the wider the choice for reaching a better solution. Student dives deeper into the subject by using open-ended and follow-up questions. Being thorough in the opening stages of resolving an issue can do wonders for the team in terms of time-saving and error-prevention. By asking questions that drive the discussion deeper, you will be establishing a firm base for upcoming areas of discussion and everyone will have a much clearer picture of the challenge at hand. Student spots the pros and cons of different ideas and solutions. Getting to know both sides of the coin contributes to developing a full, unbiased picture of a subject or an idea that’s being discussed. When we take the good with the bad and vice versa, we’re creating the conditions for rational decision-making and properly informed judgment. Student uses checklists to stay on top of his/her work. Making a list of our assignments is an essential first step towards a job well done. Using checklists allows us to have a clear overview of our activity-schedule and keeps us from overlooking some important tasks. Student confirms if the team really has a disagreement on a specific topic. If we’re not able to comprehend the opinions of people on the other side of the argument, we tend to misconstrue them, which only creates an illusion of a disagreement. The better you understand the topic, the more chance you have of figuring out if the team is actually on the same page or not. Student is capable of getting to the bottom of a disagreement. When engaged in a disagreement with your fellow Explorers, you need to focus on uncovering the roots of your conflict. Focusing on issues that appear on the surface would be the equivalent of a doctor treating symptoms and not the disease. Student is able to identify if a problem should be resolved immediately or left for another day. It’s usually a good thing to want to resolve issues the second you spot them. However, sometimes you’ll be trying to tackle several challenges at the same time, and you need to know how to prioritize them, focus on the ones that are most urgent as well as most important, and leave the rest for another time. Student shows up for meetings on time. Attending meetings at the scheduled time is crucial for productivity but also a sign of respect to your fellow Explorers and their time. Student can identify tasks and organize them into a to-do list. Creating to-do lists is a sure-fire way of increasing productivity even before the “real” work starts. Once you’ve understood your assignments, remember to organize them, create a list, and enjoy that little rush you get when you start checking them off! Student sets reminders for deadlines and important dates. We’re usually so confident in our abilities that we don’t care about taking additional precautions in order to avoid any mistakes that might happen. Setting a reminder for an upcoming big event, meeting, or a deadline, takes minimal work but it’s also shown to be a proven insurance policy. Student can break down a job into smaller tasks and submit them on time. You need to take responsibility for your assignments and an important aspect of that is being able to break them down into smaller components you can handle more easily and perform on time. Having these skills can also help your team’s overall planning process because you’ll be able to make better time assessments and design your deadlines accordingly. You made it all the way to through! We don’t have a badge for this though, but a heartful “Great Job” should work just fine! Now that you’re all caught up with how the badge system works, it’s time to go out there and get as many as you can! Have a look at some of our projects you can become a part of! 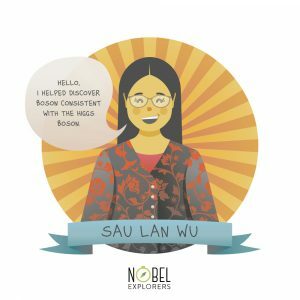 Become a Nobel Explorer Today! open up a world of amazing career opportunities! The old stereotype of girls being bad in science, technology, engineering, and math – that area known as STEM – is, unfortunately, as alive as ever. Research proves that someone doesn’t even have to personally believe this stereotype to be negatively affected by it. Just by being a commonly held notion, it influences women’s choices and the way they judge their work. For example, even women who perform as well as men in math think they’re doing worse than they actually are, undervaluing their own efforts . When it comes to school-age children, this pattern is reflected in the fact that female students underestimate their grades in math, while their male classmates overestimate theirs. This tendency will likely result in fewer girls going on to pursue math-related careers, lacking the interest, motivation, and confidence to do so . They eventually start believing that they can’t compete with boys and that their male classmates are inevitably better in STEM subjects. Other stereotypes claim the problem is the fact that, biologically, women are better with social skills, while men are naturally better in math-related fields. A study done in over 65 countries around the world, with boys and girls doing the same science test, showed that in the majority of countries girls actually scored higher than boys – but not in the United States . This outcome tells us that the notion of girls not doing well in the STEM field is not a biological fact – it is a cultural idea and a self-fulfilling prophecy. Studies also show that it’s not really that boys outdo girls when it comes to math skills, but rather that boys tend to choose more math-oriented subjects, while girls have less interest and confidence in their math abilities as they begin middle and high school . This can be partly blamed on the media – it’s been proven that women will show less interest in educational and professional options after being exposed to TV commercials showing them doing stereotypical, feminine tasks . Therefore, if we’re to work on having more girls in STEM, the key is not to simply teach them STEM. We should interest girls in these subjects and give them confidence in their abilities. Here are some ways to do this. Images children have about themselves are highly significant when it comes to their achievement in school. A confident child is ready to learn, cooperate with others, and behave as a responsible individual, especially with the guidance of a teacher and counselor  . Confidence is particularly vital when it comes to girls and STEM education. By convincing girls that they can do well, their performance will improve . And if they’re confident about their work, they’ll naturally feel more comfortable pursuing a career in the STEM field. If girls believe they can’t be as good at math and the sciences as boys, the first step is to build up their confidence – make them feel secure enough to ask questions, to show their abilities, and not to undermine their results. In order to pursue careers in STEM in the future, girls need to be sure they’re good at what they do and capable of changing their mindset. Be sure to help them acknowledge their abilities when they’re young and continue to remind them that they are capable, often all the way through their formal education and into adulthood. It has also been noted that when girls learn that they are better in one area than boys, they seem to feel they’re expected to be better in all of them . While girls who are better in math tend to have very good verbal skills, (hence so many women choosing careers that have a social element)  it is important to assure girls that it’s okay to be good at one thing, and not at another, and that learning is a process that takes time. They don’t necessarily have to be good in all STEM subjects if they’re doing well in only one. Successful STEM programs are those that encourage girls to learn from their mistakes – since they will make mistakes in a process . Making sure that girls in STEM programs know it’s okay to try, to make mistakes and to explore until they find their own particular interest, is one of the keys to having successful girls in the field. Also, make sure your expectations are not over the top. Perfectionism and making unreasonably high demands will likely backfire. Having a positive role model (such as a successful woman who has a career in a math-related field) has a “liberating effect” on girls and diminishes the stereotype. The presence of a positive icon proves to girls that it’s possible to achieve success in an area that is traditionally male-oriented . First, you can talk about those women who, throughout history, have excelled in science and math fields. History books and school curricula don’t place much emphasis on the influence women had in the past, so learning about women who were important for science is a great start. 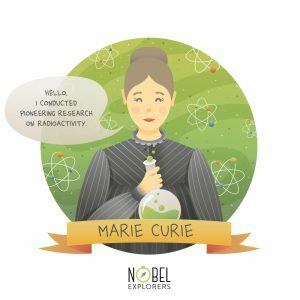 From Hypatia (Hellenistic philosopher, mathematician, and astronomer), to Ada Lovelace (considered the first computer programmer) and Marie Curie (conducted pioneering research on radioactivity), history is actually full of women who were essential to the advancement of science. However, don’t forget to include others to whom history hasn’t been so kind, such as minority women. 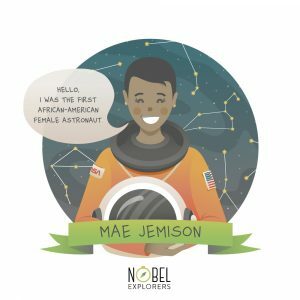 Mae C. Jemison was the first African-American female astronaut, biochemist Ruby Sakae Hirose (American of Japanese background) did groundbreaking research on blood clotting and thrombin, and Chinese-American physicist, Sau Lan Wu, helped discover boson consistent with the Higgs Boson – just to name a few. It will help girls from different backgrounds to identify better and learn that there are remarkable women from their cultures who succeeded as well. Make sure that girls meet one-on-one with women working in the STEM field. This provides an added benefit, especially when girls find that these role models have interesting lives outside their labs . Influenced by the pervasive stereotype, even girls themselves sometimes have a negative image of women working in STEM career, describing them as “meticulously dressed” or “unkempt looking”, doubting the ability for these women to balance their work with spending time with their family . In this case, it’s good to find out what kind of stereotypes girls hold, and find a role model that can break them. Most studies about girls and STEM show there is a huge benefit in gathering a diverse group of girls together, paying attention to each one of them, and keeping the activities fun. Educators must strike a balance between holding girls to high expectations and providing freedom, socialization, and engaging STEM activities. Girls in focus groups said that an important part of this is the teacher’s understanding of adolescents and their culture . There is significantly more to learning than just transferring knowledge, and individual attention and communication with and among students is really important to a good learning process . While the culture is part of the process, it’s clear that girls from the same background can have different ideas and expectations, role models, and images of what science actually is . This is why approaching each girl individually is important, as well as building a rich environment for children, teaching them to find similarities with different cultures, as well as differences in their own. If a girl was really shy and lacking confidence, persistence, caring, and encouraging more engagement was key to making progress . It is possible to reach all kids but on their own terms. This is again why finding the best ways to communicate is of vital importance, and why STEM education can’t ever be separated from soft skills. Girls and STEM education, therefore, is not just a learning process, but a process of communication, building confidence, working with a group as well as with the individual, and helping them see they are so much more than a stereotype. This journey can be fun for the girls and for you, too. Remember that by motivating and teaching girls in STEM you are not just giving someone a new skill, but helping build a diverse, better, and fairer future for all. We practice what we preach – our hard skills specialist, Aniko, is a woman and so is a large part of our international team. Additionally, all our programs welcome girls to join them and share their invaluable input with their team members. That is why if you are a parent of a girl who wants to participate in the first ever global online STEM camp, we strongly advise you to look up and enrol into one (or more!) of our projects. Selimbegovic, L, Chatard, A. and Mugny, G. 2007. Can we encourage girls’ mobility towards science-related careers? Disconfirming stereotype belief through expert influence. European Journal of Psychology of Education, 22 (3), 275-290. Mosatche, H. S, Matloff-Nieves, S, Kekelis, L. and Lawner, E. K. 2013. Effective STEM Programs for Adolescent Girls: Three Approaches and Many Lessons Learned. Afterschool Matters, 17, 17-25. Yael M. Bamberger, Y. M. 2014. Encouraging Girls into Science and Technology with Feminine Role Model: Does This Work? Journal of Science Education and Technology, 23(4), 549–561. Wheaton, M. and Ash, D. 2008. Exploring Middle School Girls’ Ideas about Science at a Bilingual Marine Science Camp. The Journal of Museum Education, 33 (2), 131-141. Moon, M, and Wilson, D. 1970. Teacher-Counselor Cooperation: Building Self-Concepts and Confidence in Children. The School Counselor, 17 (5), 364-366. Yours truly had the pleasure of talking with Nobel Explorers’ hard-skills specialist a couple of days ago. I wanted to find out more and to give you, dear reader, an exclusive peek into Nobel Explorers’ story, programs, and all the benefits your child can get by signing up for them. Aniko, Nobel Explorers’ hard skills specialist. Hey Aniko! Thank you for finding the time to talk to me. First of all, could you tell our readers what it is that you do in Nobel Explorers? I am a hard-skills team lead, and I’m also the content creator and instructor of the Coding and Web Design project. Basically, this means that I am the person responsible for the content of the projects in the sense of all the technical skills, how much coding goes in, how the content will be organized, etc. Of course, for different projects we have different developers who tackle their specific area of expertise, and I oversee and coordinate to make sure everything is aligned with the way we do learning in Nobel Explorers, with the way we do PBL (project-based learning), and with our overall goals in the team. In terms of my work on the Coding and Web Design project, I am the person who does the content, chooses the materials, who works with the Explorers, who guides them on their journey to create their first website, to code it, design it, to make it come to life and share it with the world. That’s quite a lot of work! I’m wondering, how did you get into STEM? Could you share a little bit about your educational background with us? Like a side career of a side career! (laugh) You’ve mentioned just now that you don’t think coding is limited to programmers only anymore. Which other professions do you think can benefit from coding? We’ve seen a lot of professions advance from the automation that programing brings. You can automate everyday tasks and make your life easier in any profession. Some of the professions that I have seen coding bring huge benefits to are biology, astronomy, and many more. Oh, there’s psychology as well! There are programming languages developed for stats, for getting information out of data. Good point – I remember working with those during my university years. In your opinion, why is it important to be knowledgeable about STEM? What makes STEM so crucial in today’s society? I think there are several aspects to this. I think coding will become a tool to facilitate our work and enable us to do more things in the future and do them better, more precisely. There are some things computers are really good at, and some things humans are really good at, and I don’t think… There’s often this fear that computers will replace us because they do better math, but I still think that there’s a human component to whatever we do and that we will be dared to use coding skills and programing and automation to our benefit, to enable us to do more and do better. Since you’ve touched on the topic of programming and math, I have to ask – Do we need some prerequisites in order to start coding? Do we need to know math, for example? Or can anyone learn how to code? I don’t think there’s a set of requirements. Coding is a wide field, so if you’re not really good at math, you can probably find an area that relies more heavily on logic, functional programming… In that sense, you will use some concepts from math, but it won’t necessarily be calculus or algebra that’s needed for it. Even in areas like machine learning where algorithms rely heavily on some concepts from math, there are ways that the code is organized so that you can actually use it and do amazing stuff with it without an understanding of the high-level math concepts that are behind those algorithms. That’s good to know! I’m wondering, what drew you to Nobel Explorers in particular? Nobel Explorers was one of those things that felt right from the first moment. I loved the company story, I loved the motivation behind it, I could really resonate with the long-term vision. As time was passing by, I felt like I was discovering all these new layers of Nobel Explorers that I did not see initially or that have developed in the meantime, and it has always been a positive surprise. There are always new challenges ahead of us, but we have an amazing team with versatile backgrounds and experiences, and there is no way we don’t come up with a solution if we put our heads together. Could you tell us a little bit about the programs? NE programs are designed as a way to engage Explorers, and they are conceived around something called PBL (Project-Based Learning), which means that the way we learn and the way we teach in NE is a really hands on experience. So there is not a lot of theory, not a lot of teaching where everybody’s just listening to one person sharing the knowledge, but we have real-life tasks with real-life values, and everything our Explorers learn is focused towards achieving a certain goal. So you will never code just for the sake of coding, you will code to create a website, to solve a real-life problem, and the one thing we really make sure happens is that the project does not end with the Explorers’ time with us, but that they create something that is maintained in the real world. For example, once they create a website, that website is accessible to everyone, it’s spread to the community, and they can even work on it further if they wish to. What is it that makes Nobel Explorers’ programs different from other projects you’ve worked on? I think one thing that Nobel does in an excellent way is to try different approaches to education. We constantly go through testing and adapting to make sure that we’re giving and sharing the knowledge in a way that is fun, that is accessible, and that has real value. I’m not sure if all of these components are unique and if no one else does them, but definitely the combination of all the different aspects is definitely unique to us. The fact that we integrate teamwork and collaboration in an international environment – I think that’s the magic recipe and the secret sauce. You are a hard-skills specialist, but I assume you work very closely with the other people in the team. Could you tell us what made you include soft skills as well in your program? What makes them so important? As I said, coding and STEM are only tools. Coding is a skill you can acquire, but in order to create really good, unique things that are amazing, always takes the joint effort of a team. And soft skills enable us to collaborate and communicate and share ideas in a way that ensures they are being heard which, in turn, ensures that we can bring our knowledge together and not just work as individuals. Because as a team, we can always achieve more. So kind of like Steve Jobs didn’t start out alone but he had Steve Wozniak with him? What is your message for parents who are thinking about joining the NE programs but are not sure about it? If you are thinking of NE vs. another program, apart from us having amazing content, the outcome is that in a really short time, we teach kids or anyone working on our projects a lot of things. For example, in the Coding and Web Design project, we manage to organize content that takes somebody who didn’t know how to code, and in 13 meetings, or 26 hours of time with us, they learn to code a website from scratch, organize it, make it visually appealing, and publish it on the web. If you ask me, that is pretty amazing. Become a Nobel Explorer today or contact us if you have questions about our projects. October 20, 2018 /0 Comments/in For Individuals, For Students /by Jelena N.
We’ve already begun a discussion about conflict in our article Conflict Can Be Good, where we concluded that conflict is inevitable and part of all of our relationships. We discovered that conflict can be good and has many benefits when managed appropriately. Given this, it’s best to embrace the inevitability of conflict and learn how to manage it. Learning conflict management doesn’t mean subscribing to only one pattern. Clearly, everyone has their own styles of conflict management. Each person has a unique style which reflects their own unique wants, needs, and values. However, there are specific global patterns in conflicts that can be identified based on how we deal with such challenges. The important thing to remember is that no one style is a pure typology and inherently better than any other. You must be wondering, What are the benefits of being aware of my own style? Well, as you recognize your style you can better understand its strengths and weaknesses. Also, you can increase your ability to adopt different styles relative to the inevitable conflicts that arise in all interpersonal relationships as you learn when each style is best to employ. 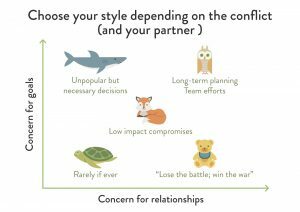 According to two researchers, Thomas and Kilmann, we can identify five conflict-handling styles: competing, collaborating, avoiding, accommodating, and compromising. To illustrate these styles, they selected specific animals, because various personality traits can be represented in a more balanced strengths-and-weaknesses framework this way. Do it my way or not at all! This is the typical attitude of the shark. Sharks use a forcing or competing style to achieve their goals. They have a need to win – therefore, others must lose. When competing, an individual pursues his or her own concerns at the other person’s expense, using whatever power seems appropriate to win their position – even if it means being uncooperative, threatening, and intimidating. They strongly defend a position they believe is correct or simply try to win. If the shark’s decision is truly correct, a better decision can result. However, it may result in hostility and resentment toward the shark, or damaged relationships. This style may be appropriate for emergencies when you need quick, decisive action, and people are aware of and support the approach, or when unpopular decisions need to be implemented. My preference is … What’s your choice? Owls use a collaborative or problem-confronting conflict management style. Owls value their goals and relationships. They gather information, look for alternatives, dialogue openly, and welcome disagreement. Owls view conflicts as problems to be solved and work to find solutions agreeable to all sides. The advantage of this strategy is that relationships are maintained (because both sides get what they want) and negative feelings are eliminated. On the other hand, this takes a great deal of time and effort to synthesize everybody’s ideas. The appropriate time to use an Owl style is when the issues and relationship are both important. Turtles avoid, withdraw, deny, or delay conflicts. They would rather hide and ignore conflict than resolve it – this leads them to be uncooperative and unassertive. Turtles even tend to give up personal goals. This may help to maintain relationships that would be hurt by conflict resolution, but conflicts and negative feelings may linger, too. This is often appropriate when the issue is trivial or the relationship is insignificant. Sometimes it can be effective when the atmosphere is emotionally charged and you need to create some space. Teddy bears use a soothing or accommodating conflict-management style with emphasis on human relationships. They agree and flatter because they have a need to please everyone involved. Therefore, teddy bears often neglect their own desired outcomes to satisfy those of the others. There is an element of self-sacrifice. Sometimes accommodating maintains relationships, but the bear may be taken advantage of. However, it’s good to use this when you really don’t care about the issue or when you realize you are wrong (and the other party has a better solution). I’ll give you this if you give me that. 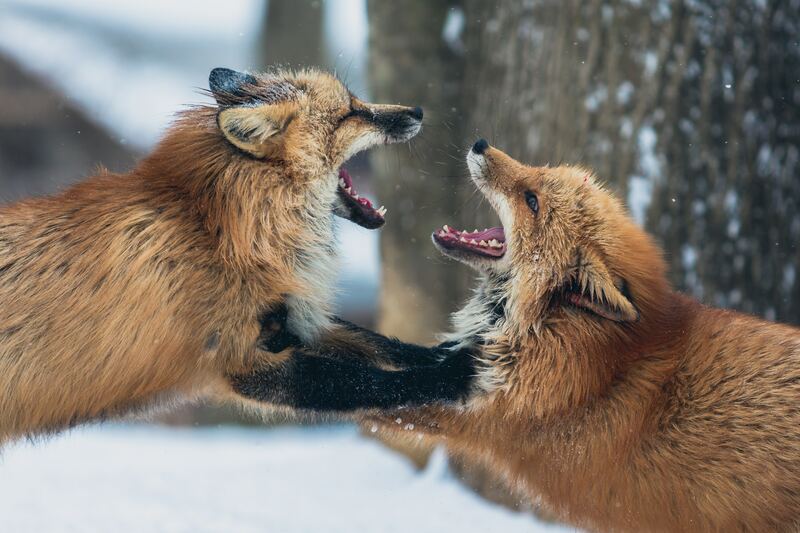 Foxes use a compromising conflict-management style. Individuals who use this approach are concerned about goals and relationships. They have a strategy of a little something for everyone – they tend to find mutually acceptable solutions that partially satisfy both parties. Foxes are willing to sacrifice some of their goals while persuading others to give up part of theirs. Compromise is assertive and cooperative. This way it is possible to maintain relationships and find solutions, but compromise is not always ideal. Compromising is suitable to use in situations when complex issues have no clear solutions or when people in conflict have equally important solutions. How to use styles of conflict management? Imagine that you’re going out with a friend. You want to go to the movies and relax. However, your friend wants to go shopping, because they’re attending an important event that evening and want to find a really nice outfit. How do you decide where you’re going? You love your friend, you want them to be happy, so it’s okay if you please them and go to the shopping center with them. But, let’s imagine the second scenario – everything’s the same except that today’s the last day that movie is playing! And you really want to see it… What would you do this time? Would you choose to be a compromising fox? If I help you buy an outfit for that event, you go to the movie with me. What do you think about these scenarios? How do you choose how to react? The fastest way is to consider your concern for goals and concern for relationships. Check out the graphic below. Abraham Maslow said If the only tool you have is a hammer, you tend to see each problem as a nail. Likewise, if you have only one predominant conflict resolution style, there are inherent limitations or blind spots, which is why we’ve sought here to help you expand your usual conflict style by introducing other styles and approaches. In Nobel Explorers, we want everyone to learn how to manage conflicts in the most effective way. So, if you find this article useful and want to practice the skills significant for managing conflict – negotiation, check out which projects we offer. Eckstein, D. (1998). Styles of conflict management. The Family Journal, 6(3), 240-243. Thomas, K.W. and Kilmann, R.H. (1974). Conflict Mode Instrument, Sterling Forest, New York. August 12, 2018 /0 Comments/in For Educators, For Individuals, For Students /by Jelena N.
What do you think of when you hear the word conflict? Many people view conflict as bad, negative, and tend to avoid it. They believe that conflicts lead to “ugly” feelings, mistrust, damage to relationships, etc [1, 3]. True, there are indeed many possible negative consequences. Given this, can conflict be good? As with almost anything, conflict has advantages and disadvantages. So, the answer is yes – conflict can be good! Conflict has the capacity not only to cause harm and pain, but also to create a positive change for us [1, 3]. A possible reason for its bad reputation is that conflicts are often poorly managed and handled in painful ways. Under appropriate conditions, conflict can provide important benefits. Conflicts focus attention on problems that need to be solved, but which have previously been ignored or neglected. Creation of energy, focus, and the motivation needed for solving problems. Released negative emotions (anger, tension, anxiety, sadness…) and better control of emotions. Conflicts may prevent disagreement from becoming more intense or damaging. Enhanced quality of many decisions– the critique of someone’s ideas by others encourages a more thorough evaluation of them. Also, discussion of incompatible ideas may result in adoption of a more open-minded approach to issues and problems. Facilitation of understanding of other people’s perspectives on the problems. Increased closeness with each other and relationships clear of irritations. If the conflict is among groups, it leads to increased loyalty and cohesiveness. This further results in enhanced performance and productivity. Stimulation of curiosity, interest, and information search. Conflicts also encourage the consideration of new ideas and approaches and leads to facilitation of innovation and change. Growth– conflicts may promote cognitive, social, and moral development. So, under what conditions can conflict be beneficial? Let’s start with emotions. Conflict often creates the arousal of powerful negative emotions: anger, frustration, suspicion, etc. Also, it can cause stress and anxiety, which can lead to loss of sleep, decrease in productivity, and failure to be innovative or creative [2, 4]. At the same time, conflict situations often require the careful processing of complex information such as the opponents’ motives and intentions, their strategy, and the impact of their moves. This means that in order to solve the conflict constructively, you need to put in a great deal of cognitive effort. However, the likelihood of effective completion of these cognitive tasks is significantly reduced by the presence of powerful emotions . So, what can we do about that? A great way to master your skills in managing conflicts and making them constructive is to participate in Nobel Explorers, the first international STEM camp that focuses on soft skills as much as on the hard skills. In Nobel Explorers, we are aware of how powerful conflict can be and how important it is in negotiation. That’s why participants of all our projects work hard on mastering their conflict resolution skills with the help of our soft skills facilitators. And they earn cool badges like these below while doing that, so it is also fun! How can we maximize the probability that conflict will produce positive outcomes? In order for conflict to have benefits, it’s important either to avoid the arousal of negative emotions or to take active steps to reduce their presence . It doesn’t have to look like this! Putting effort into inducing participants in the conflict to focus on the potential gains that may be obtained from a favorable resolution. In other words, try hard to show the participant(s) in conflict the advantages of choosing the resolution you think is best. Providing participants with information as to why an opponent has adopted a particular stance. Here, you don’t need a third party – you can enumerate for the opponent arguments for the position you represent. This way, their reactions may be considerably more favorable and less emotional. Induction of positive affective states that are incompatible with anger or frustration. You can’t be happy and angry at the same time, right? Exposing persons in a conflict situation to mild flattery, a small gift, etc. For example, lower your voice and tell them how good they are at managing conflict. Now when you know how to handle negative emotions in conflicts, there’s one more thing –practice! The more you practice, the better you will be. The reality is that conflict is part of all our relationships – at home, at school, at work… This being the case, it’s best to accept its inevitability, understand that it isn’t necessarily bad, and to practice managing it. Other than learning how to handle differences in opinion, in Nobel Explorers you will also be able to practice a very cool skill that will help you turn every conflict into a constructive one and find a win-win solution for it. Remember, The World Economic Forum listed soft skills as the skills you’ll need to thrive in the future since a lot of the jobs will be automated and taken by AI. One of those skills is negotiation and it has a lot to do with managing conflict! So, sign up for Nobel Explorers and master your future-ready skills! Johnson, D. W., & Johnson, F. P. (2013). Joining together: Group theory and group skills (12th ed.). Boston: Pearson. Zillmann, D. (1979). Hostility and Aggression. Hillsdale, NJ: Erlbaum.